Do you know what is Bachelor of Science in Computer Science ( bsc cs ) ???? Bsc it consist of 6 sem, all sems has programming as well as theoretical subjects, with practicals. Students should do detail study about subjects, theory as well as practical subjects. Theory subjects are conceptual and will help with relating things in real world. 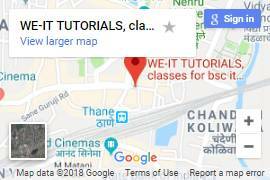 Practical subjects are those subjects which consist of coding and methodologies here students have to put plenty amount of efforts because once student understand concept, syntax, logic he is ready to work with other technologies. in industry we need coders , automation testers. Referring question answer pattern notes might be helpful for short time, and student will be useless after passing bsc cs, the reason is that its into the box study. many times students dont attempt question because they dont understand what to write due to question is asked in twisted manner. dynamic and detail study is important. Students can refer classes notes, classes forum, tech-max, sheth, reference books, ebooks. Dont do yours bsc cs for name sake, getting jobs in IT industry with shallow knowledge is not possible, it will waste yours 3 years, and the reason of doing bsc cs will be waste. Note : Master in IT/CS (Msc IT/CS) / MCA / MBA will we more effective with JOB.